Robert Smithson (1938 – 1973) is one of the pioneers in this exhibition. He was perhaps the most brilliant of the American land artists. His most famous work, >Spiral Jetty< was made in a formerly commercially used area at the Salt Lake in Utah. 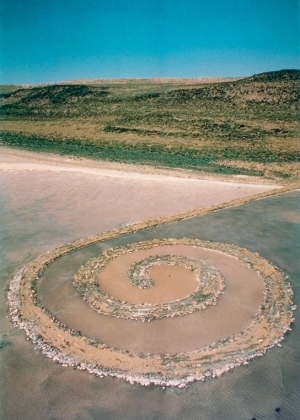 The film, which is part of the work, shows the car ride to the shore, the raising of the spiral jetty in the lake, the artist walking over the bumpy spiral, while the sun is reflected in the water, but also pre-historic exhibits from the Museum of Natural History in New York, and cartographic material. Thus we can experience the becoming and passing of the earth, across times and spatial limits.